Update to My Problems ! (01.09) 1 more problem is added to My Problems section. You can see it by direct link also – my problem No.9. (31.08)Have added 3 more problems to my list in My Problems section. I hope, I haven’t done any mistakes when trying to do everything faster. Please let me know if any link doesn’t work. Thanks!! (30.08) When created a site, I’ve planned to add my published problems here. But with all other activities never had time. Now I’ve decided at least to start! For now the very first 5 my published problems (4 of them are orthodox helpmates) are added in My Problems section. Hopefully, I will add all the problems in 2-3 weeks. Most likely, I’m the most interested person in this section. It is my memory.. and seems like several first problems for me are the most meaningful. I have written some comments to them. And could write much more! 🙂 The fact is that I remember the time of composing them much better, than for some recent problems I have. I believe, it is the same for many of you.. Or? (28.08) Welcome to the well-known Macedonian author – Bosko Miloseski! Presenting to you a very pleasant problem – see No.118! (26.08) I’m happy to add a joint problem by 2 Hungarian authors – No.117 by Tibor Érsek & János Mikitovics. Welcome to Tibor Érsek and a gratitude to János Mikitovics for the activity! I’d like to remind, that you can click on the Original Problems tab on the top to see the whole list of published problems. Problem numbers are links to the problems – click on any number to see the problem. Standard search using Ctrl+F also works for the list. Tourneys, tourneys!.. Let me repeat, that all fairy computer tested problems published at Julia’sFairies participate in informal tourney JF-2012. Thank you very much for so great activity here! And I’d like to remind you about the thematic tourney, with the closing date 15th of October, HS-problems with battery play – Julia’sFairies-HSP-2012 ! Just 2,5 weeks is left till the 55th WCCC in Kobe! I’ve written a short post about it with the links to the WCCC2012 site. for those, who never solved before! This post is dedicated to Latvians (Rigans really), who participates in the project IGRA.lv. (“igra” in Russian = game). This is not about chess at all! Commands, who participate in the game, have to do many very different things. This time a pre-game to get the additional bonus was to solve a fairy problem! The problem above was composed for this game. So, it was impossible to find a ready solution in the internet. 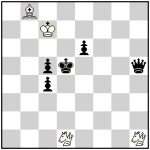 The only information the commands have got was that this is a helpmate (they had to find what it is), has 2 solutions of 2 moves, and a strange figure on d1,h1 was called a “shaman” with a given definition how it moves (in reality it was a simple Lion, but it was also not easy to find out it). The author was not mentioned as well. Click here to see how the problem was presented to the commands by the organizers of this game (in Russian only). And click on the diagram to see the problem with solution. As I know, at least 2 commands have really solved the problem themselves. Congratulations to you!!! I hope you enjoyed the solving and the happiness at the moment when you have found the right solution! I was also surprised a lot to see about 10 of you at my site, and you were on the right way looking at fairy terms and at popeye solving program! As I was told, some of you have solved a problem using solving software! So, you have done 2 things: have found the right name of the fairy piece, have learned how to install and to use a program! Congratulations to you too!! It is not that easy if you do it for the first time. As I know for now, about 7 commands have submitted the right solution. But I don’t know how many commands participated in total. Dear participants, I had fun during your time of solving… And now I wish you good luck in the real game you have this night!!! (25.08) Warm welcome to Zoran Gavrilovski, Macedonia! I have a pleasure to show you a very nice problem – see No.116 ! (24.08) A joint problem by 2 authors is added – see No.110.1 by Mečislovas Rimkus & János Mikitovics, which is an improvement of No.110. (23.08) See just black pieces in a new problem by Michael Grushko – No.115 – a play of 5 Andernach Grasshoppers! (23.08) Welcome to Romanian author, Paul Răican! See just 4 pieces & 3(!!) fairy conditions in a rich play – No.114. (22.08) Nice to see one more problem by Gani Ganapathi! See surprising castlings in No.113 ! (22.08) Warm welcome to Michael Grushko, Israel! See 2 problems (hs# and h#) – No.111, 112. The latest update of the WinChloe Echecs database! The latest update (as of 12-Aug-2012) of WinChloe Echecs database is available for those, who uses it. The number of problems has increased till 437957! 53 of original problems published at Julia’sFairies are added to WinChloe Echecs database as of 12-Aug-2012 – you can see the list of them(pdf) I’ve exported from WinChloe! I’d like to add that WinChloe offers 2 possibilities of exporting diagrams: bitmap (graphics like I have on the site) and rtf-form (text form, which uses Echecs font to display the board and pieces, used in my exported list of problems here). I’d like to write more about WinChloe program and I will do it part by part when have time. For now my WinChloe section has just some basic information about, but you can leave your comments/questions there – I’d try to answer (as also some other users of WinChloe maybe?)! (21.08) I’m so happy to have visitors from the neighboring country! Welcome to Mečislovas Rimkus, Lithuania, and aristocrat-problem No.110 !! (20.08) The last problem I’ve published at night is like an answer to my own last publication. I’m touched with the dedication in No.109 by János Mikitovics. Thank you, János! (20.08) Happy to see Israel presented on the site! See a direct mate this time, No.108, by Semion Shifrin. Warm welcome to the author! (20.08) I have a pleasure to welcome world-known French GM Michel Caillaud! Enjoy analyzing of a problem No.107 ! (20.08) See 3 complicated problems with many fairy conditions by Karol Mlynka – No.104, 105, 106. Such problems are not easy to analyze and comment. If anyone can – please do! (18.08) I’m very happy to welcome on the site world-known author from Poland, GM Waldemar Tura and to present to you not complicated but nice his problems – No.102, 103. (18.08) One more problem by Peter Harris opens a new hundred of problems – see No.101! I believe that Peter wouldn’t mind if I mention here, that 19th of August is his birthday! The very best wishes to You, Peter!! (18.08) Happy, happy, happy to publish No.100 (my own 🙂 ) Although, had no time for wine, as few other problems were waiting for publication! Please see my No.100 – dedicated to all of You, dear authors, commentators, visitors! What I have done is really what we have done all together! Thank You !! (17.08) One problem by Peter Harris, shown in the comments, is added to the original problems, as it deserves so! – see No.99! (17.08) The second series of problems by Emmanuel Manolas is added! See selfmates with Maximummer this time – No.96, 97, 98! (17.08) Welcome to the new author from India – Gani Ganapathi! See his nice miniature No.95! (16.08) See a new problem – No.94 – by three Italian authors: Valerio Agostini, Gabriele Brunori & Antonio Garofalo! Thanks a lot to the authors! The Congress takes place from September 15th to September 22th, 2012. Attention: Composing tourneys are starting to appear there! 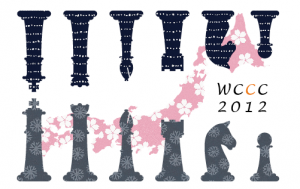 I like how the WCCC2012 site is decorated with the sakura-like flowers and colors. (15.08) Welcome to the new author at the site – Jaroslav Štúň, Slovakia! See No.93 – nice miniature, anti-batteries. (15.08) See one new problem by János Mikitovics – No.92 – nice miniature, shows Masand condition. (14-15.08) Please see new problems with KoBul Kings condition by the well-known author from Greece, Emmanuel Manolas – No.88, No.89, No.90, No.91. I believe, you’ll like Emmanuel’s series! Thanks a lot to the author! (14.08) I’m happy to present you a problem by the world-known German authors – No.87 – by Dieter Müller, Franz Pachl & Sven Trommler! Warm welcome and thanks a lot to the all of you!! (14.08) Welcome to the new author from Spain, Luis Miguel Martín! See 2 nice problems: No.85 and No.86. (13.08) 2 new problems by Peter Harris are added – No.83, 84. The second problem, No.84, is dedicated to Hans Gruber to occasion of his Birthday (24.08). (11.08) Welcome to new author, Anatolij Kornilov, Russia! See Anatolij’s first try with ser-hs# problem – No.82! (11.08) I’m very touched about the dedication of No.81 by Peter Harris! Thank you, Peter! – for the problem, for your activity and help! (10.08) Welcome to Antonio Garofalo, Italy!! 2 new problems by Antonio Garofalo are added – No.79, No.80. See the list of published problems on the main page of Original problems and my post about it! Hope, you like it!